KANNAPOLIS, North Carolina (Sept. 19, 2018) – Aric Almirola and the No. 10 Smithfield Get Grilling Ford Fusion team for Stewart-Haas Racing (SHR) return to Richmond (Va.) Raceway this weekend for the second time this season after scoring the highest SHR finish of sixth in the opening Monster Energy NASCAR Cup Series playoff race last weekend at Las Vegas Motor Speedway. In this year’s April Cup Series event at Richmond, Almirola ran as high as second before ending up 17th. He finished Stages 1 and 2 of the race second and third, respectively and was close to finishing out the event in the top-10 before a late-race restart caused him to go four-wide and get shuffled back to midpack. This weekend, Almirola’s Smithfield livery will look a little different from the traditional black, white and gold scheme. The No. 10 Ford Fusion will sport Smithfield’s summer grilling paint scheme. 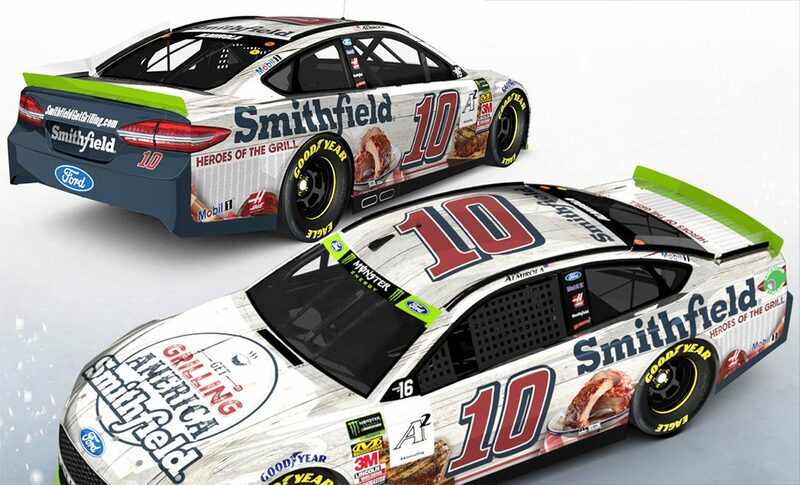 Additionally, fans who submitted their “Hero of the Grill” nominee earlier this season via SmithfieldGetGrilling.com will have their grilling heroes names included on Almirola’s car this weekend. The three-quarter-mile oval facility at Richmond, which just completed an infield renovation, typically puts on one of the best shows in the sport. The 34-year-old Almirola has six starts at tracks a mile or less in length this season, completing every lap except at Bristol (Tenn.) Motor Speedway in August when a mechanical issue forced the No. 10 Smithfield Ford Fusion behind the wall for repairs. In 13 starts at the Richmond oval, Almirola has captured one top-five finish and four top-10s. He has an average Richmond finish of 16.3 with 99.9 percent of laps completed. He earned his best finish of fourth in September 2015. He has six Richmond starts in the Xfinity Series with one top-10 finish, 10 laps led and an average finish of 16.2. Fans can still enter for their chance to win Smithfield’s Smoke Machine Mustang designed by team co-owner Tony Stewart with the help of drifting champion Vaughn Gittin Jr. They helped create a one-of-a-kind Ford Mustang RTR Spec 3 that will be given away to one lucky fan. Fans can register for their chance to win the suped-up Mustang and a trip to November’s Ford Championship Weekend at Homestead by visiting SmithfieldRacing.com, or by texting SMOKE to 82257. Richmond marks the 25th points-paying event during which the Smithfield livery has adorned Almirola’s No. 10 Ford Fusion. Smithfield, a brand of Smithfield Foods, which is based approximately five hours northeast of SHR headquarters in Smithfield, Virginia, is in its seventh season with Almirola and its first with SHR. Founded in 1936, Smithfield is a leading provider of high-quality pork products, with a vast product portfolio including smoked meats, hams, bacon, sausage, ribs, and a wide variety of fresh pork cuts. In 27 Cup Series outings this year, Almirola has an average start of 17.8 and an average finish of 14.3, with one top-five finish and 11 top-10s. He’s also led 115 laps this season, already a career best. Almirola is third among the four-driver SHR contingent in the playoff point standings. This is your first year at Stewart-Haas Racing and you’ve also been paired with a new crew chief Johnny Klausmeier. How has it been working with him? You’re 12 points to the good in the standings, but you finished 17th at Richmond earlier this season. How do you feel going into this weekend? ​Aric Almirola will make his 272nd career Monster Energy NASCAR Cup Series start and his 14th at Richmond (Va.) Raceway. Almirola is ninth in the playoff point standings after last weekend’s sixth-place finish at Las Vegas Motor Speedway. Almirola was the highest-finishing Stewart-Haas Racing (SHR) driver in last weekend’s event. The Tampa native’s 14 starts at Richmond, he has an average finishing position of 16.3 and an average starting position of 22.3. The Smithfield driver finished in the top-five in the first two stages at Richmond earlier this year. Almirola will appear at the Smithfield display in the Richmond fan zone Saturday at 4:35 p.m. EDT to help judge Smithfield’s “Hero of the Grill” contest between BBQ pitmaster Tuffy Stone and the ultimate tailgating pro, Daina Falk (@TheHungryFan). The 34-year-old has led 115 laps this season, the most in his Cup Series career. In April 2015 at Richmond, SHR driver Kurt Busch captured the team’s only victory at the .75-mile oval. Overall, the team has 13 top-five finishes and 25 top-10s in 58 starts. The SHR team is the only four-car organization with all of its entries locked into the NASCAR Cup Series playoffs. Fans can enter for their chance to win the Smithfield Smoke Machine Ford Mustang designed by team co-owner Tony Stewart and drifting champion Vaughn Gittin Jr. for Smithfield’s Mustang giveaway. Fans can enter for their chance to win the tricked-out street car and a trip to November’s Ford Championship weekend at Homestead-Miami (Fla.) Speedway by visiting SmithfieldRacing.com or by texting SMOKE to 82257. Ford has 14 wins this season with 10 of the victories coming from the SHR camp – Harvick with seven, Clint Bowyer with two and Kurt Busch with one. Harvick also captured the $1 million grand prize with a victory at the non-points-paying All-Star Race at Charlotte (N.C.) Motor Speedway. The 2018 season marks the 10th anniversary of SHR. The Kannapolis, North-Carolina-based team is co-owned by Stewart and Gene Haas and has recorded 49 victories and 40 poles since its inception in 2009. Stewart won the 2011 NASCAR Cup Series title and Harvick gave SHR its second title in 2014. SHR’s Kurt Busch won last year’s Daytona 500, and Harvick won June 25 at Sonoma (Calif.) Raceway and Nov. 5 at Texas Motor Speedway in Fort Worth. Harvick scored back-to-back-to-back victories – Feb. 25 at Atlanta Motor Speedway, March 4 at Las Vegas Motor Speedway, and March 11 at ISM Raceway near Phoenix – then back-to-back wins May 6 at Dover (Del.) International Speedway, May 12 at Kansas Speedway in Kansas City, July 22 at New Hampshire Motor Speedway in Loudon and August 12 at Michigan International Speedway in Brooklyn. Harvick also won the non-points-paying Monster Energy All-Star Race at Charlotte. Clint Bowyer scored his two wins March 26 at Martinsville (Va.) Speedway and June 10 at Michigan International Speedway in Brooklyn. Busch captured the victory Aug. 18 at Bristol (Tenn.) Motor Speedway.